'Lisbon: Recipes from the Heart of Portugal" is filled with photographs that showcase Portugal's capital city. 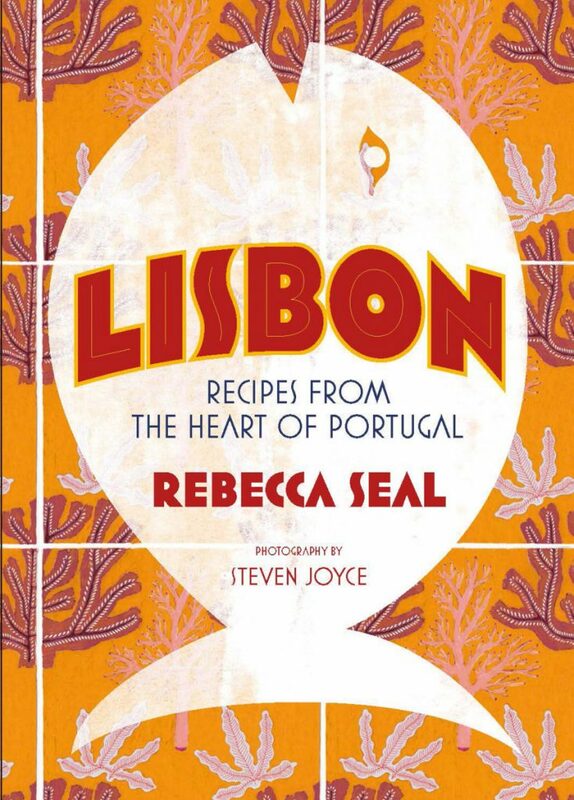 My interest in “Lisbon: Recipes from the Heart of Portugal,” a new cookbook from U.K.-based food writer Rebecca Seal, stemmed from a single recipe – that for watercress soup. While flipping through the book, I saw a picture of the starter and felt as if I had just learned the name of an elusive song that had been stuck in my head since childhood. Well maybe not since childhood. Ten years ago my twin brother and I went to Europe; we spent a good bit of time in Portugal. At a restaurant where we ate every day of our stay, we were served a bowl of a thin orangey-yellow soup, tinted orange by pureed carrot and packed with peppery, slightly wilted greens. Until picking up “Lisbon,” I had never been able to identify or even adequately describe the restorative soup, which was equal parts light and hearty. Seal is a U.K.-based food writer highly regarded for her approachable, regionally specific cookbooks. In “Lisbon,” she offers an array of recipes as diverse as the country’s landscape. With the book in hand, an avid cook can make a Lisboan feast starting with petiscos, or Portuguese tapas, and ending with an assortment of traditional egg-based desserts (think ‘Fios de Ovos,’ thin strands of egg yolk solidified in sugar syrup). Many of these traditional recipes get brief histories, which detail their place of origin and cultural significance; Seal writes, for example, that samosas became a household staple in Portugal after it began colonizing parts of India in the early 1500s. Seal’s husband, photographer Steven Joyce, illustrates “Lisbon” with shots of the food – plated on flatware that would be the envy of any William Sonoma wedding registry – and of the beautiful landscape in and around the city. He captures the city’s classic Iberian architecture as well as its contemporary, downright hip hospitality scene. Several of his photos – the watercress soup among them – filled me with nostalgia. Unfortunately, I couldn’t find watercress at the supermarket, so I decided to take the opportunity to step out of my culinary comfort zone: I’d make roast octopus. The recipe is simple, as are the ingredients, excepting, of course, the octopus itself. I picked up some fresh octopus and followed the cooking instructions carefully, but the cephalopod reminded me of a Shrinky Dinks toy – it got a whole lot smaller after it was exposed to heat. Throughout “Lisbon,” Seal suggests substitutions and simplifications of all kinds. For this roasted octopus recipe, she writes that vacuum-packed, pre-cooked octopus can work just fine. In hindsight, perhaps I should have gone with the pre-cooked? But I pressed on with fresh, putting a little color on the octopus in a sauté pan, then combining it with a smoked paprika–heavy dressing. The octopus had a lovely, tender texture; the dish had a rich color and smelled remarkable. I reached for a fork – delicious. Paul Pedersen is a student at the University of Southern Maine, who recently finished an internship in the features department of the Portland Press Herald. 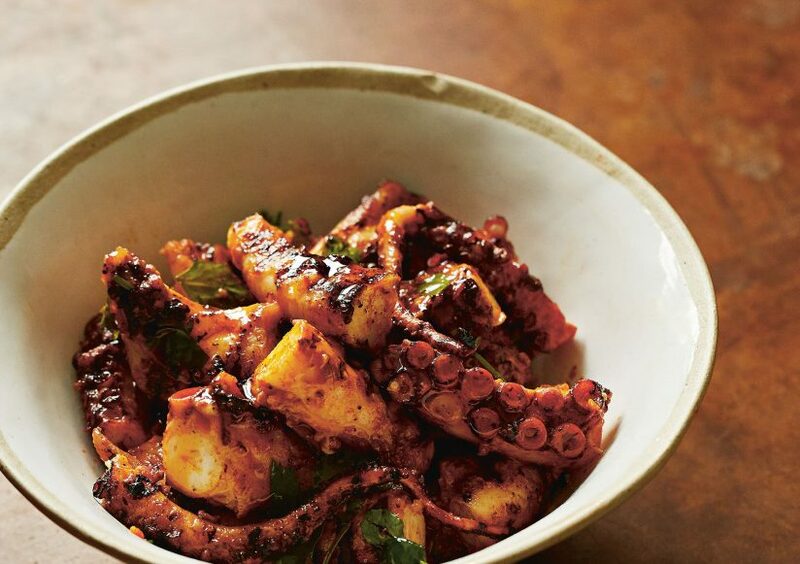 “Don’t be intimidated by octopus – it takes a little time to prepare, but most of that is simmering time, and it is really easy to cook,” “Lisbon: Recipes from the Heart of Portugal” author Rebecca Seal says. Place the octopus, garlic and bay leaves in a large saucepan with a lid over a high heat and bring to the boil without any added liquid (the octopus will release plenty of its own). Reduce the heat and simmer for about 1 hour, or until the meat is really tender. Remove from the liquid, drain and pat the octopus dry with paper towels, then slice into chunks. Heat a griddle pan over a high heat and add a splash of oil, followed by the octopus pieces. Cook, turning often, for about 5 minutes until gently charred all over. Remove from the pan and place in a large bowl. Meanwhile, whisk together the smoked paprika, crushed garlic, olive oil and lemon juice. Dress the octopus with this and taste a piece – it almost certainly won’t need salt, but you may like more lemon or garlic. Finish by stirring through the fresh chopped coriander. Eat warm.